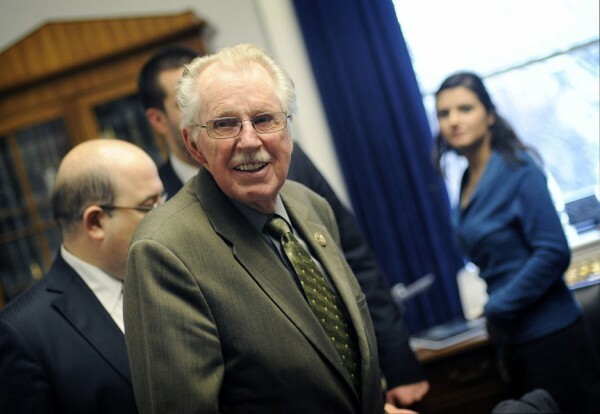 Rep. Roscoe Bartlett (R-MD) is one of the the country premiere proponents of preparedness against doom. Such concerns are typical among “survivalists,” a loose national movement of individuals who advocate self-sufficiency in the face of natural or man-made disasters, gathering online or in person to discuss the best ways to prepare for the worst. What is atypical is that the owner of this cabin is Roscoe Bartlett, the longtime Republican congressman from Maryland. Over the past two decades, he has developed a following as one of the country’s premier proponents of preparedness against impending doom, even urging the more than 80 percent of Americans who live in urban areas to relocate. Bartlett, 86, is a patent-holding scientist, an engineer and a farmer. He has also become one of the country’s most endangered Republicans. Maryland Democrats redrew his reliably red congressional district this year to include a swath of blue-leaning Montgomery County, leading analysts to call the second-oldest member of the House an underdog in his November reelection bid against financier John Delaney (D). But the possibility of electoral defeat does not appear to have changed Bartlett’s focus — to alert Americans to a future fraught with danger. On Sept. 30, barely a month before Election Day, he will be in Spokane, Wash., more than 2,000 miles away from his district, serving as the keynote speaker at the second annual Sustainable Preparedness Expo. Bartlett, who declined a one-on-one interview, recently sat around a Capitol Hill conference room table with a group of like-minded experts to unveil legislation that calls for “every citizen to develop an individual emergency plan to prepare for the absence of government assistance for extended periods” and for communities to become capable of providing 20 percent of their own power, food and water if necessary. The electric grid, everyone agreed, is vulnerable to natural disasters and terrorist attacks. “This is possibly the most serious threat the United States faces right now, because we are so utterly unprepared for it,” said Richard Andres, a senior fellow at National Defense University. At a Go Green Energy Expo organized by his office in Frederick last month, Bartlett mentioned “One Second After” and asked, “How many of you have read the book?” He asked the same question at the recent Capitol Hill event. The 2009 novel imagines an EMP attack on the United States, focusing on efforts to survive by residents of a North Carolina mountain town. “One Second After” was written by William R. Forstchen, who is also known for co-writing counterfactual historical novels with former House speaker Newt Gingrich (R-Ga.). Forstchen paid tribute to Bartlett as “a true public servant” in the book’s acknowledgments, and Bartlett returned the praise, inserting a statement into the Congressional Record in 2009 advising Americans to read it. Bartlett became interested in preparedness during the Cold War, when people and businesses commonly built bunkers in case of a nuclear attack. Yet, it seemed that no one was thinking about the next step. “When you came out of the fallout shelter, what then?” Bartlett wondered. Bartlett’s warnings aren’t necessarily tinged with fear; the scientist seems to view self-reliance as a puzzle to be solved, just as he appears to take a special pride in showing off the efficiencies of his “off-grid” West Virginia cabin. Bartlett bought his property in the Monongahela National Forest in 1980. It cost about $1,000 to build the cabin, he says in the documentary, with much of the materials brought in by cart because the road was so rough. The main attraction in the kitchen is a wood-burning cookstove, which also heats the house and its water. There is also a small propane stove, for use “as long as propane is available,” and a hand-operated pump that brings water up from an underground spring. In “America’s Cities,” a separate documentary with similar themes, Bartlett approvingly cites the financial adviser and author Howard Ruff — an influential figure among survivalists — who counseled that “the most important investment you can make” is to have a year’s supply of food for your family, and “the second-most important investment” is a thousand-dollar stash of silver coins and jewelry to bargain with in an emergency. Bartlett is a devout Seventh-day Adventist and an active member of his congregation in Frederick. When he enrolled at Columbia Union College, he planned to become a minister. He chose to become a scientist instead but earned an undergraduate degree in theology. The idea that the end of the world is near, and that people will be judged, is a key tenet of Adventist beliefs. “It’s right at the core,” said Ronald Numbers, a University of Wisconsin professor who has written books on the faith’s history. But Numbers estimated that only a small percentage of Adventists prepare for end times by moving to remote locations and storing food. For Bartlett, the lifestyle his cabin affords him is ideal, regardless of whether disaster strikes.